EL SALVADOR was reborn 25 years ago. On January 16th 1992 the government signed a peace accord with left-wing guerrillas at Chapultepec castle in Mexico City, ending a 12-year civil war in which 75,000 people died. The agreement, followed by a truth commission that laid bare the war’s atrocities and by an amnesty, was a model for reconciliation in other countries. It underpins El Salvador’s political order today. Stirring as that achievement was, the festivities held to commemorate it this week fell flat. The convention centre in San Salvador’s Zona Rosa, not far from where guerrillas invaded the capital in 1989, prompting the first peace talks, was emptier than normal for big events. A small exhibition, displaying military uniforms, guerrillas’ weapons and quotes about peace from the likes of Confucius and John Lennon, lined the walkway to the stage. The crowd, clad in white, seemed more interested in free pupusas (bean-and-cheese filled tortillas) than in the speeches. The event ended with a confetti drop, listless applause and a return to the food queues. The mood was downbeat because El Salvador’s 6m people have little to celebrate. The dominant feeling these days is “fear, not peace”, says Alejandro Marroquín, a member of a breakdancing group that was invited to the commemoration. Having fled gang violence in greater San Salvador four years ago, he thinks that “the war has continued. The only difference is that now it’s between the gangs and the government.” El Salvador is the most violent country in the Americas, with a murder rate of 80 per 100,000 people—more than 15 times that of the United States. That is not the only disappointment. After an initial spurt, economic growth has dropped to a torpid 2% or so, less than half the Central American average (see chart). Corruption is rife. Two post-war presidents face charges; another one died last January before he could be tried. Many Salvadoreans have given up on their country. More than 40% want to leave within the next year, says a new poll by the Central American University. That is the highest level since the university started asking the question a decade ago. A big factor behind these let-downs is the flaws of the main political parties, heirs to the combatants of the civil war. Since the peace accord, the right-wing Nationalist Republican Alliance (Arena) and the leftist Farabundo Martí National Liberation Front (FMLN) have had turns in power. (The current president, Salvador Sánchez Cerén, a former guerrilla commander, belongs to the FMLN.) They renounced war, but failed to learn statesmanship. The antagonism between them is abnormal for rivals in a democratic system. The FMLN still yearns for socialism, though it has reconciled itself to the market economy for now. Arena’s party song proposes a different goal. 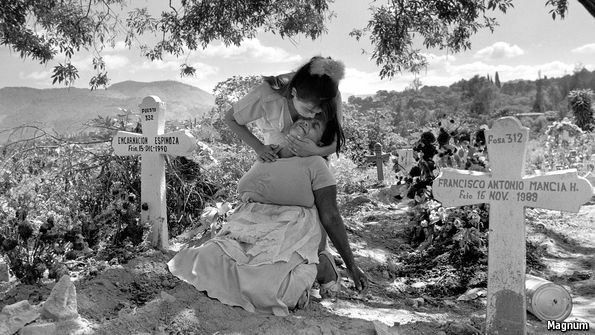 “El Salvador will be the tomb where the reds end up,” it prophesies. The clash “doesn’t allow for a vision of the country”, says Luis Mario Rodríguez of Fusades, a pro-business think-tank. About the only thing the parties agree on is that the real point of wielding power is to enjoy the spoils. The result is what Salvadoreans call a “patrimonial state”, which justifies itself through patronage and stifles any institution that stands up to it. El Salvador’s leaders now finally realise that a new peace agreement of sorts is needed. Mr Sánchez Cerén used the commemoration ceremony to present a special envoy from the UN, Benito Andión, to “facilitate dialogue”. Just how Mr Andión, a Mexican diplomat, will interpret that is unclear. Some suggest that his job will be to help broker a peace between the government and the two main gangs, Barrio 18 and Mara Salvatrucha. But the UN statement on Mr Andión’s appointment says his job is to “address the key challenges” affecting El Salvador, which sounds like a broader brief. Just as in 1992, “we need dialogue that matches today’s historical moment,” declared Mr Sánchez Cerén. Gridlock has brought El Salvador to the brink of economic catastrophe. After years of slow growth and overspending, in part to prop up a state pension scheme, the central government nearly ran out of cash late last year. Blocked from long-term borrowing by the opposition, which has more seats in congress, it stopped making monthly payments to municipalities. Health workers went on strike after the government reneged on wage agreements. It came close to a default on its debt. A deal in November between the government and Arena averted disaster by allowing the government to issue $550m of new debt in exchange for agreeing to a “fiscal-responsibility law”, which would cap borrowing and spending. But that is just a stopgap. The opposition, doubting that the government will keep its fiscal promises, has refused to approve the budget for 2017. Another crisis looms. “We are playing with fire,” says Alex Segovia, an economist. The quarrel is partly about how to reduce the budget deficit, which was an estimated 4% of GDP last year. The FMLN wants to lift the government’s low revenue by raising income tax and levying one on property. Arena pushes mainly for spending cuts. The parties have yet to agree on a needed reform of pensions. A “negotiating table” set up last April has so far failed to come up with a solution. The government has called in the IMF, which may now broker a resolution to the crisis. A budget deal, if it happens, would unlock just one of the many manacles on the economy. El Salvador’s use of the strong dollar as its currency keeps prices stable but holds back exports. 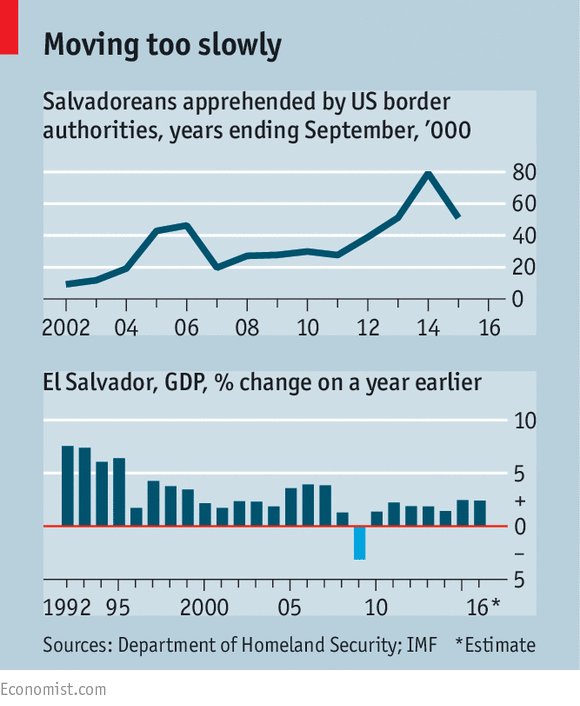 A lethargic bureaucracy is another obstacle: shipping goods from El Salvador to the United States is no faster than from Vietnam, says an observer in San Salvador. With a trade deficit of nearly 20% of GDP, El Salvador depends on remittances from 2m Salvadoreans living in the United States. Its biggest firms are consumer-oriented conglomerates that mainly live off the American bounty. Nothing constrains the economy more than crime, which deters investment and drives young workers out of the country. The cost of violence and insecurity is 16% of GDP, by one estimate. Gangs extort vast sums from businesses, equivalent to 3% of GDP. Recently, the threat of gang violence has emptied entire villages. In September one local government in western El Salvador set up a camp on a basketball court for dozens of families that had been ordered to leave by gangs, the first settlement for internally displaced people since the civil war. The FMLN government, which tries to seem as tough on criminals as is the opposition, claims that its recent crackdown is working. Security forces have killed 900 gang members over the past two years. The government has largely cut off mobile-phone contact between imprisoned gangsters and their confederates on the outside, who operate the extortion business and carry out murders. The number of murders dropped by 20% last year to 5,278. Mara Salvatrucha and a faction of Barrio 18, perhaps weakened by the government’s offensive, have recently proposed a dialogue with the government and offered to lay down their arms. Barrio 18 even offered to give up extortion. The FMLN has so far rejected negotiation. Critics contend that the government’s mano dura (iron-fist) policies have worsened conditions in prisons, which were already appalling. They say that the killing of gangsters by police amounts to state-sponsored murder. Such brutality will provoke more violence, believes José Luis Sanz, director of El Faro, a digital newspaper. When the state does something right, it is usually in spite of the main parties rather than because of them. The process of appointing people to such sensitive jobs as prosecutor and high-court judge is designed to ensure that only creatures of the political parties get them. On occasion, though, less pliant candidates slip through. Such is the case with Douglas Meléndez, attorney-general since 2016, who startled Salvadoreans by pursuing corruption cases against figures of both parties. One FMLN ex-president, Mauricio Funes, has taken refuge in Nicaragua. Antonio Saca, who governed until 2009 as a member of Arena, is in jail awaiting trial on charges that he helped embezzle $246m of public money, roughly 1% of GDP. “To see a president in handcuffs was like something out of a film,” says Roberto Burgos of DTJ, an NGO that promotes good government. The constitutional court has also shown an independent streak by challenging political parties’ abuses. Such checks on power are El Salvador’s best hope for cleaning up government and modernising politics. But the ruling party has responded to defiance with threats and abuse. Demonstrators encouraged by the FMLN have been issuing death threats against constitutional judges, says Sidney Blanco, who sits on the court. Independent-minded officials survive in office thanks largely to backing from outside powers such as the United States. Photos of Mr Meléndez in the company of foreign ambassadors send the message that he is not alone, notes Mr Burgos. American support for the attorney-general is part of a broader programme to improve governance, investment conditions and law enforcement in El Salvador, to weaken the lure of emigration to the United States. El Salvador is a beneficiary of the Alliance for Prosperity, which provides it and the two other countries in Central America’s “northern triangle”, Guatemala and Honduras, with nearly $750m a year. Authorisation to spend that money in El Salvador probably would have been withheld had the government shut Mr Meléndez down. Salvadoreans expect that assistance to continue under the Trump presidency. Its aim, after all, is to slow down immigration. That is encouraging. But something is wrong when outsiders show more of the political will needed to reform El Salvador than do the country’s own politicians.